At this special time of year, the Rotary Club of Rushen & Western Mann and its members are active in filling shoeboxes with gifts of toys, toiletries, educational items and household goods to be sent to less privileged children in Eastern Europe. This year the Appeal has received wonderful support from staff at Equiom, Isle of Man. 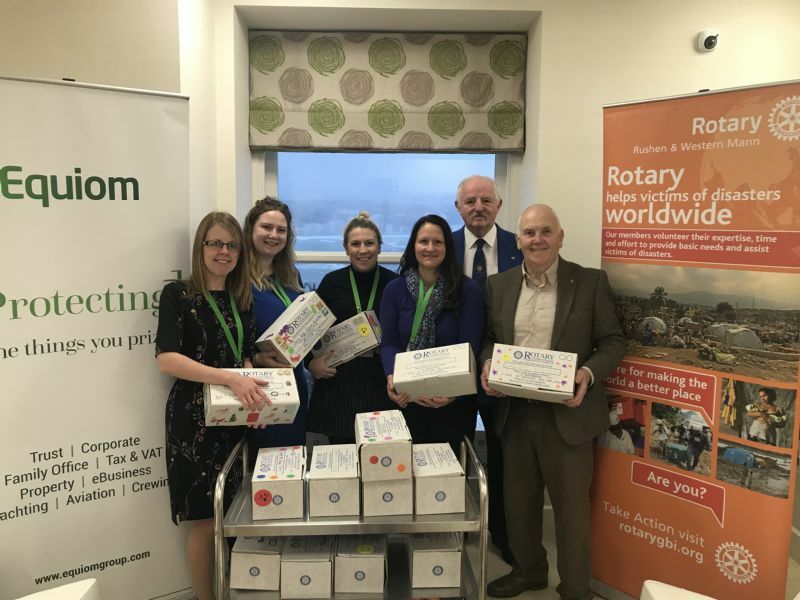 Lucy Hendy from the Equiom charity committee said staff co-ordinate fundraising activities for a number of causes throughout the year and we were thrilled with the level of support Equiom staff showed for the Rotary Christmas Shoebox Appeal this year. We managed to collect and send a total of 57 boxes to children in Eastern Europe. Thank you to the Rotary Club of Rushen & Western Mann and Manx Independent Carriers for presenting this opportunity to us. Rotary Club Vice-President, John Lindon and Rotarian John Quaye, visited Equiom where they were presented with the boxes by members of the staff charity committee. John Quaye is also the Chairman of Manx Independent Carriers who kindly ship the shoeboxes off island free of charge. Members of St Johns Chapel and the Inner Wheel Club of Rushen & Western Mann have again supported the Shoebox Appeal, thank you to all concerned.